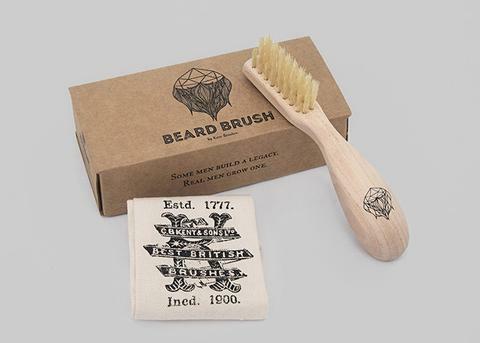 Boar Bristle Beard Brush designed for right handed use. Handmade in the UK, Kent’s wooden beard brush has specially cut and shaped boar bristles to improve brushing performance so it can handle the coarsest of facial foliage, whilst still being gentle on your skin. The cut and shape of the boar bristles is specially designed to improve performance; position the brush with the longer bristles above the shorter ones and brush downwards. The shape of the handle also means the hand is away from the face during brushing allowing total access to the beard. Each brush comes with a beautiful hand-stitched cotton bag printed on both sides. Not only a handy bag to store your brush in but for those who use beard oil it will protect your clothes from any excess oil held in the brush head from leaching into unwanted places e.g your suit pocket. This brush is suitable for right-handed gents.